Greetings! My name is Rob Shapiro. 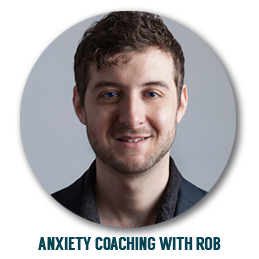 I'm a motivational coach for people suffering with anxiety, worry, and depression. I struggled for many years with chronic worry, panic attacks, obsessive thoughts, and depression. For well over a decade, I've been living free because of these unique healing methods. 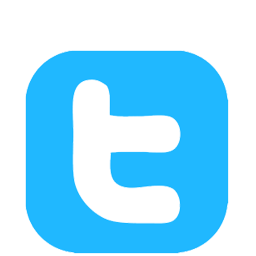 Since this site was published in 2001, I've had the pleasure of mentoring thousands of sufferers from around the world. Each one of us is the hero or heroine of our story, encountering various characters and situations throughout life. We create our own story as we move along. Instead of telling ourselves the tragic story, we can tell the heroic story. A cool anxiety attitude is what we’re looking for, and fortunately it’s always there for us. We have a choice in how we view our experience of anxiety & depression. We can see it as transformative or we can see it as terrible. Most of us take the terrible view. We fight against the darkness. It's not common for us to embrace the experience and show respect for the challenges that have been given to us. When we fight against anxiety, we chain ourselves to the experience. Its continued existence relies on opposition. When we learn the art of self-trust, we are released from the shackles of fear. Self-trust increases the immune system of the mind. Self-trust is true medicine. How can you start healing, today? You can start by learning the art of self-trust. Self-trust runs quite deep. It's not simply trusting yourself in specific circumstances. Self-trust is an all-around feeling of trust in your ability to handle life's challenges, changes, worries, and losses. It's also the conviction and trust that you are worthy of feeling happiness, respect, love, and peace. Nurturing those beliefs into your self-concept generates genuine self-esteem and self-trust. Each time we experience anxiety/worry, we engage in a certain set of rituals. We are unaware of most of the rituals because they are subtle and quiet. They cause you to continually suffer. Running away from a place or idea that scares you is a very simplistic ritual. I will help you identify the numerous subtle and secretive rituals that continue to keep anxiety and depression at bay. In addition, there are countless behaviors that cause us to betray the self -- resulting in self-distrust. As you learn how to truly trust yourself in the face of fear, you will be taking a shortcut around your symptoms. No longer will you have to deal with panic and obsessive worrying head-on. We take a detour. And regardless of whether you inherited a genetic disposition to anxiety or lived through circumstances beyond your control, you can still find relief if you learn how to heal the foundation from which your symptoms arise. You need two things: a compelling strategy and the right motivation to guide you. We live in a world of instant gratification. It's no surprise that many of us resort to medication as a solution. Medication is only one tool, but it's not a total solution. Many of us learn breathing techniques, cognitive techniques, and relaxation practices. These are also useful tools, but not complete solutions. My method is about instilling a deeper all-around trust in yourself. The method also motivates, inspires, and teaches you how to have a more positive and fun attitude in the face of fear. The first step is to get unstuck. Many people drain emotional energy trying to 'stop' worrying, instead of allowing worry to have its say. Despite how scary our worries seem, the ability to shift focus from getting rid of anxiety to a radical acceptance, is the first step. This helps builds self-trust. 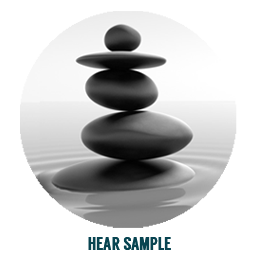 My 10-hour audio healing journey teaches you self-trust in the face of fear. 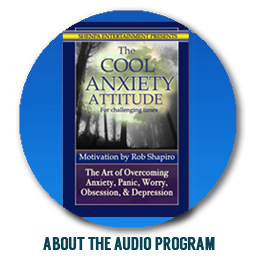 - The “Cool Anxiety Attitude"
- How to develop an anxiety hero within. - Much, much, much more! You will not find Anything like this out there! Hands down! My 10-hour program will bring you to that place where you can find relief. This is the program that I would have wanted when I was in the depths of anxiety and depression. Audiobooks offer one of the greatest ways to absorb healing strategies while you commute to work, rest in bed, cook food, or exercise. 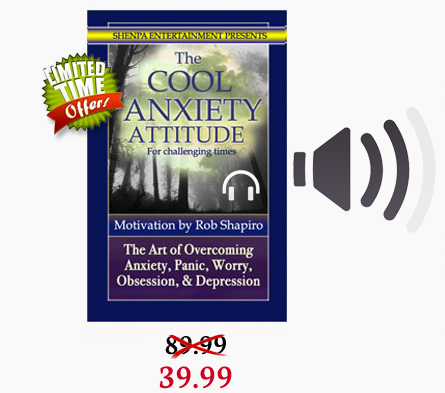 After listening to a few chapters, you’ll already find new strength and vitality to overcome fear and get through difficult times. That’s how I designed it. This is for you and your very own dark moment! 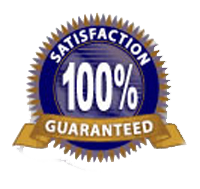 You have nothing to lose; your Satisfaction is Guaranteed. If for any reason you are not satisfied, please contact me for a full refund, and you can keep the program as a bonus!